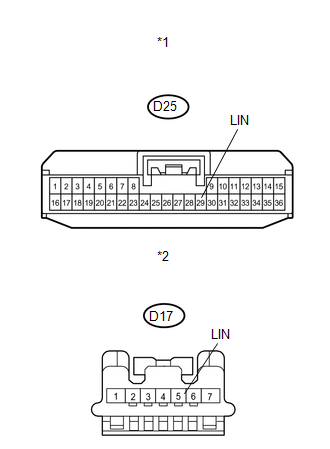 This DTC is stored when LIN communication between the certification ECU (smart key ECU assembly) and steering lock ECU (steering lock actuator assembly) stops for more than 10 seconds. No communication between the steering lock ECU (steering lock actuator assembly) and certification ECU (smart key ECU assembly) for more than 10 seconds. If the certification ECU (smart key ECU assembly) is replaced, register the key. 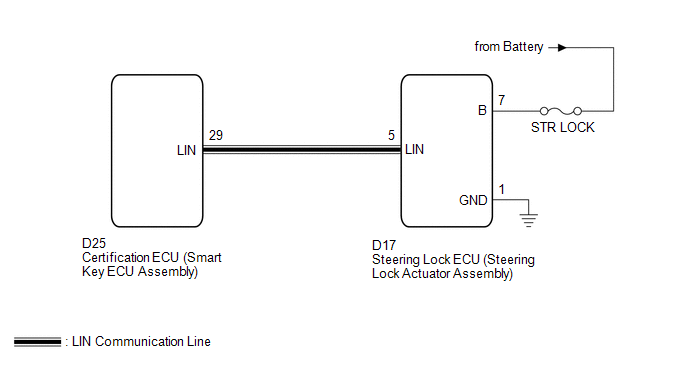 If the steering lock ECU (steering lock actuator assembly) is replaced, register the ECU code. 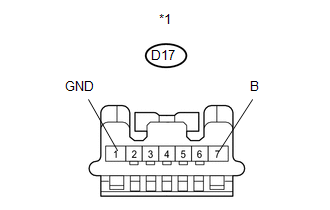 (a) Disconnect the D17 ECU connector. (b) Measure the resistance and voltage according to the value(s) in the table below. (a) Disconnect the D25 ECU connector. (a) Replace the steering lock ECU (steering lock actuator assembly) (See page ). DTC B2786 is not output.